Chinkaiseki Hachimangu Shrine stands on the hill overlooking sunset and the sea in Itoshima, Fukuoka, Kyushu, JAPAN. As Chinkaiseki Hachimangu is a prestigious shrine with a long and distinguished history, many worshippers from all over Japan and from abroad visit the shrine. 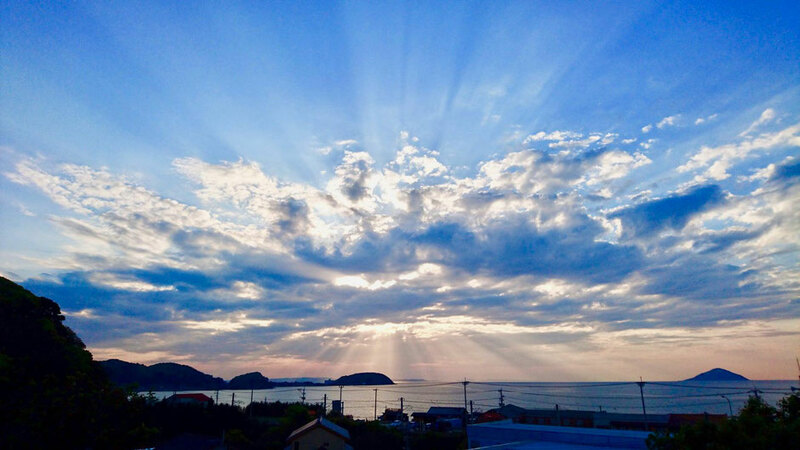 Not only sunset in the evening, able to watch beautiful scenery in the daytime. Photo is a projector of the nature. Chinkaiseki Hachimangu is a famous childbirth shrine which is enshrined the sacred stones named "Chinkaiseki" since A.D. 200 (1800 years ago) in the Japanese Mythology in Kojiki (Records of Ancient Matters) and Nihonshoki (Chronicles of Japan). The shrine has power to bless couple with BABY through pregnancy and safe delivery. We provide the Charm at shrine office. • Kotohira Shrine (near stone bridge) : Prosperous business, economic fortune (lucky in money), travel and traffic safety. • Sae-no-kami god (shrine at overlook) : Village guardian deity, expel evil. • Sarutahiko god (stone at slope) : Guide to help someone's life. Famous poet Yamanoue no Okura composed about the sacred stones in 729. The oldest stone monument of Manyoshu (The Anthology of Ten Thousand Leaves : Japan's oldest anthology of poetry) in the Kyushu region was built in 1856 the Edo era. Brochure (12 pages color print, ¥ 800 yen) of Chinkaiseki Hachimangu Shrine. Goshuin is calligraphy and a vermillion stamp on a paper that is given at a shrine. 22-meter-high stone wall is in the shrine. The wall was built by the feudal load and castellan of Karatsu Castle. Now, able to enjoy the commanding views of the sea and sunset on the stone wall. 2 approaches to the overlook. Right side is slope with hand rail. Left side is steep steps. 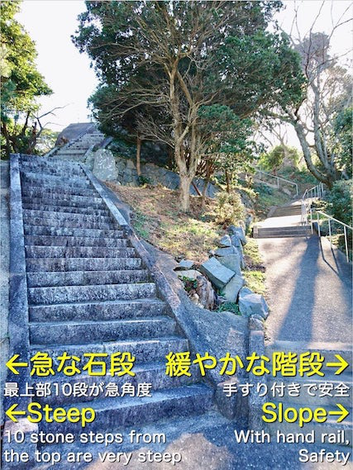 As about 10 steps from the top are very steep on the left side, please climb keeping your hands on the steps for support. View from the overlook at the top of the stairs is a beautiful sight. Cherry blossoms are on both side. Able to enjoy viewing both cherry blossoms and the sea. In addition, able to watch sunset as well in the evening. Photos are on the "桜SAKURA". In cherry season, I'll post the up-to-date blooming information. On the hill, able to overlook STUNNING SUNSET by the 3 features of geography. (1) Direction of beach facing to north-west shows us sunset through the year. (3) On the landform like fortress, feeling of surrounding the sky a 360-degree view. [How To Get There] See the Access MAP (Click), when you visit the shrine. Article on the front page about Chinkaiseki Hachimangu Shrine published in Sankei Shimbun on July 13, 2017. Chinkaiseki Hachimangu Shrine was featured as a prestigious shrine on the historical TV program on April 7, 2017. Chinkaiseki Hachimangu Shrine is introduced on the website of the VISA card members' magazine as the shrine which has wonderful sunset views. Kashii-gu Shrine gives a stone named “Chinkaiseki” to prayer for safe delivery. “Chinkaiseki” is stones which are the objects to worship of our shrine. Kashii-gu Shrine is closely linked to Chinkaiseki Hachimangu Shrine because both shrines share the same enshrined deity. Completed construction of the new main sanctuary in December 2017. "Cuddle Hearts💛" stumps appeared when we cut trees in the precincts.